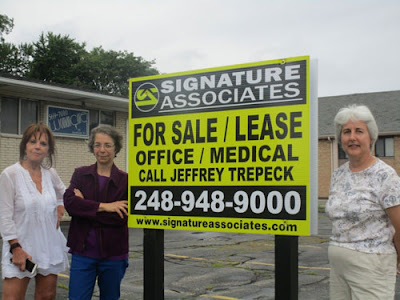 One of Michigan's most notorious abortion clinics has gone up for sale, as reported by long-time sidewalk counselor Dr. Monica Miller in LifeNews.com. Womancare of Southfield has not been performing abortions for several months. The latest owner, abortionist Jacob Kalo, has now officially run up the white flag and admitted defeat by posting the property for sale. The clinic itself has a long and terrible history accompanying the thousands upon thousands of lives ended in the most brutal fashion imaginable there. It was formerly owned by notorious abortionist Alberto Hodari, and at least three women have died following abortions under his care: Chivon Williams, Regina Johnson, and Tamiia Russell. It was behind this clinic that Dr. Monica Miller discovered the bodies of babies being dumped in the trash along with abortion patient records for more than 200 women. Hodari escaped truly serious consequences for anything that went on there. Details on that and other abortion clinic abuses can be found in our landmark report on the abortion industry published in 2011. The clinic's future changed in 2012 with passage of the Prolife Omnibus Act, forcing abortion clinics to undergo basic health and safety inspections. Hodari retired and sold the clinic to Kalo. The clinic has had numerous problems recently adhering to the health code. Now Kalo has surrendered, acknowledging the notorious clinic is incapable of being run safely or competently. Good riddance! The final closure is a reminder of how horrible the abortion industry is and how incapable they are of following even basic rules that real medical clinics are required to follow. Today Michigan is down to 16 facilities that advertise they perform induced surgical and medical abortions (using the abortion pill), plus five Planned Parenthood clinics that only perform medical abortions. That's a total of 21 dedicated abortion facilities in the state. In 2010 Michigan had 34 facilities that performed surgical and medical abortions. Now we have 16. We’ve closed more than just half of the large-scale facilities in six years; many closed because our Prolife Omnibus Act forced them to adhere to basic standards. The worst of the worst have been driven out. Despite these closures Planned Parenthood has been making an aggressive move to corner the abortion market in Michigan. For them, dealing in death is a big business. In 2007 Planned Parenthood operated 34 offices in Michigan, three of which performed abortions. Today they operate 19 offices in Michigan, yet eight perform abortions. Planned Parenthood provides more than a third of the nearly 1 million abortions done annually in the United States, and their abortion numbers have been growing even as abortions have been decreasing. In Michigan they now operate eight of the 21 total facilities, matching their "market share" nationally. The next priority of the prolife movement is defunding them. Planned Parenthood can leverage more than half a billion dollars in taxpayer funding every year to expand their abortion services (while cutting women's health services) and muscle out the smaller competition. It's time to put a stop to millions of prolife taxpayers being forced to help advance Planned Parenthood's mission of abortion at any cost.